The a6400 introduces advanced "Real-time Eye AF," the latest version of Sony's Eye AF technology. This capability employs artificial intelligence-based object recognition to detect and process eye data in real time, resulting in improved accuracy, speed, and tracking performance of Eye AF. In all autofocus modes, the camera now automatically detects the eyes of the subject and activates Eye AF with a half press of the shutter button, and when in AF-C or AF-A mode, the preferred eye (left or right) of your subject can be selected as the focus point. Choices include Auto / Right Eye / Left Eye, and a Switch Right / Left Eye function is able to be assigned to a custom function as well. This technology frees the photographer to focus solely on composition with trust that focus will be tack sharp on the subject's eye. Eye AF support for animals will be added in summer 2019 via a system software update. 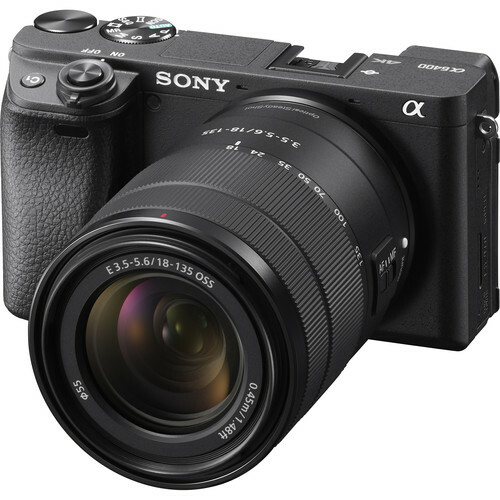 Sony's a6400 is equipped with a 24.2MP APS-C image sensor that is paired with an upgraded BIONZ X processor to deliver improved image quality and color reproduction in all types of shooting conditions. Standard ISO ranges up to ISO 32,000 for both stills and movies and is expandable up to ISO 102,400 for still images, with good noise reduction at medium and high sensitivities. Alpha a6400 Mirrorless Digital Camera with 18-135mm Lens is rated 4.7 out of 5 by 33. Rated 5 out of 5 by Sheila from Love this camera! Im a long time Nikon shooter, relying on my D500 for BIF and other action shots, like dogs running. I tried the early Sony Nex models, and went all the way to the a6000 before selling my Sony gear and buying an Olympic mk5ii and lenses,which were nowhere near as good as the a6000. Now along comes the a6400, and I sold the oly gear and bought the a6400 along with the 18-135 and 70-300 Sony lenses. I could not be happier, the speed and accuracy of the AF rival the Nikon d500, and the keeper Raye went from about 50% with the a6000 to 30% with the Oly, and now easily 90% with the a6400. An incredible camera! Rated 5 out of 5 by Virginia from Great camera with much to offer at a bargain price I got tired of hauling my DSLR gear to airshows and other flying events I enjoy. So, I switched to a small affordable mirrorless camera to save weight and space. Sonys cutting edge technology combined with B&Hs legendary availability and rapid shipping filled my need. I got my a6400 with the 18-135mm kit lens and am delighted with the package deal. The attached photos were taken at 135mm with the kit lens. Although it took time to master the menu and program the camera, the reward for doing so is well worth it. Rated 5 out of 5 by Nick from This Camera Was Made for Me I was torn about buying this camera (for me it was a real investment). Even though Im a noob to filmmaking, Ive been around cameras and filmmakers most of my life. There were a lot of naysayers about this unit, but I just kept seeing the checkmarks for things I needed in a camera. 4K. Mirrorless. Huge Sensor (not FF), Mic Jack, Log Shooting, Proxy Shooting, Selfie Screen, Battery Life, Overheat Resistant. The list goes on. I did my research, and I knew what was right for me and what didnt matter as much at my level. This camera was made for me. Rated 5 out of 5 by Andrew from Well worth the price! At first reading the specs it might seem like its lacking with no IBIS and limited touch screen functionality but boy was I in for a surprise. This is an excellent option for beginner or intermediate photographers or even videographers. The a6400 is faster on start up than the a6500 and has unlimited recording time for video. The autofocus is crazy FAST and battery life does seem to be improved. Very happy with this purchase. Rated 5 out of 5 by Ronald from Good upgrade Ive been using the 6300 since it was introduced and loved it. The 6400 however is an excellent upgrade and well worth the asking price. The auto focus system is as advertised, quick, accurate and the tracking is excellent. Its hard not to be impressed with the facial and eye AF feature. Im finding the image quality better, but I think its because Im able to get more images in focus than with the 6300. The body is the same as the 6300, but the menu system is dramatically improved. I find it better organized between photo and video settings and the availability of the My Menu is a fantastic addition letting you have a separate menu of settings you use most often. How, if Sony can develop a G Master quality lens specifically designed for ASP-C well really have something. Rated 5 out of 5 by Randall from Great BTS cam! I cant speak on its photo capabilities as I purchased specifically as a BTS camera during my projects. Ill cut to the specific points as to why I think this camera is a step above the a6500. + Color science is better (matches A7 III) + No video recording time limit + No over heating issues (yet), even in non-ideal situations + Autofocus capabilities and quality are outstanding + 1080P footage is improved over the a6500 (was always too soft) Negatives -Battery Life; I mean it has a small battery, cant expect much. About an hour of battery life when shooting video. -IBIS -- no in body stabilizer but honestly, I only put this here because many people will definitely whine about it. But the a6500s IBIS was actually not that great. Its physics -- theres not a lot of room for the sensor to float around. All around -- this is a fantastic camera for a great price. The 4K image is great, the form factor is perfect for BTS or small projects, and you can get near cinematic images in inconspicuous spaces because of its size. Rated 5 out of 5 by Brian from This camera is Awesome! I shot on Nikon for years before moving into Sony mirrorless. I currently own an a6000 and an a7ii and am very familiar with them. I was looking for something to shoot video with (specifically YouTube and interview videos) so I liked that this didnt have the 30 minute limit. I had no clue how many advances had been made since the a6000 was released. I try to avoid new camera info because it always leads to me getting excited and buying one. The flip up screen is great and I love being able to monitor myself while recording. I know you can always add a monitor to other cameras (I even own one) but when I have a video idea I want to get it going as quickly. That means I usually forgo looking for the monitor and hoping Im in the shot correctly. The videos have come out INCREDIBLE so far and Im beyond happy with the purchase. The only thing Im not excited for is re-configuring all of my custom buttons and menus but thats the case with any new camera and if thats my biggest issue then life is pretty good :) If you own an a6000 or are looking for a camera that does both video and photography really well then definitely give this a good, hard look. If youre sitting there with an a6300 or a6500 then the decision to upgrade (or is it sidegrade?) is a little trickier. Go to a camera store and test it out... if you love the a6300 then youll absolutely love this camera but if you have the a6300 then you most likely dont *need* this camera. If that makes any sense. Rated 4 out of 5 by Paul from Focus Menus The camera takes outstanding pictures. The only issue I have with it is the focus menus are outrageously confusing. There must be a better way to automatically put it in tracking focus, really. So I can not recommend it to any person that has problems with following menu selections and wanting a camera with little hassle as possible. So if one feels challenged by menus do not buy this camera. But then again one can set it to automatic and shoot away. But you dont need this camera to do that. Does the 18-135mm lens that it comes with as part of this package have OSS (in other words, is it like, say, the 18-105mm f4 G OSS lens)? clean hdmi? &amp; recording camera time? Hi Pablo, the a6400 does provide clean hdmi output. The recording time is Approx. 70 min (Viewfinder) / Approx. 75 min (LCD monitor) (CIPA standard). Does the new A6400 use the same e-mount lens and battery as A5000? TIA! Does this body have silent mode? Does the new A6400 have &quot;in body&quot; lens stabilization? There is no in-body image stabilization. 5-axis SteadyShot INSIDE image stabilization will not be featured like in the SONY a6500 camera.